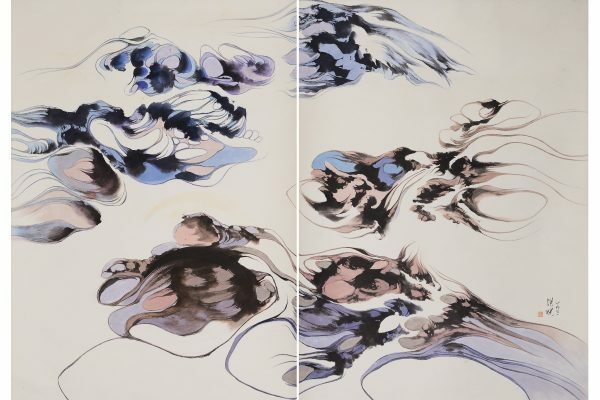 Coming soon: “Guo Hua: Defining Contemporary Chinese Painting”. Join us for Asia Week New York 2017 and through April for an exhibition exploring the boundaries of what Chinese painting means today, running March 9 – April 29. Additional information and catalog to come. Stay tuned. Asia Week New York 2017 is just a month away! Stay tuned for exciting updates from M. Sutherland Fine Arts. In the meantime, mark your calendars for March 9–18th. M. Sutherland Fine Arts is open by appointment for Autumn Asia Week, September 9–27th. Hung Hsien (aka Margaret Chang) is the most intriguing artist I’ve shown in the fifteen years of M. Sutherland Fine Arts. With Hung’s exhibition during Asia Week 2016, it is my hope that the art world will take notice and recognize her singular position in the pantheon of modern Chinese painting. I first met Hung Hsien when I was a graduate student in Lawrence, Kansas, in the late Seventies. I was astonished by the fantastic forms in her pictures, her striking pastel palette, and the abstract tension of the compositions. The paintings left an indelible impression. In all my years of looking at contemporary Chinese painting while living in Taiwan, Beijing and Hong Kong, I have never seen anything else like this. The pictures in this exhibition are clearly modernist, but delivered with the brush skills of a classical ink painter. 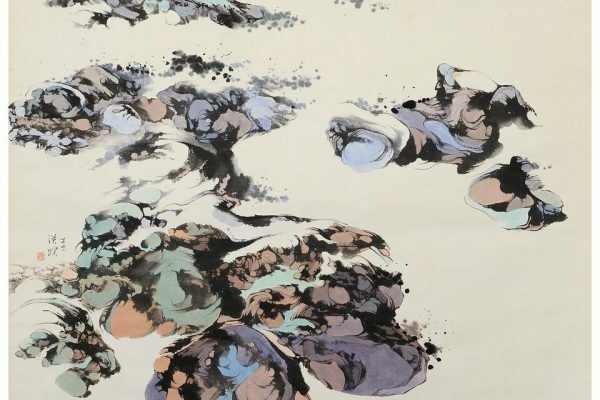 They are “landscapes” but have more affinity to “mod” designs of the Swinging Sixties (think Lava Lamps and Pucci scarves) than the gong bi (fine line style) bird and flower paintings of Hung’s famed teacher, Prince Pu Hsinyu. In “Ocean Rocks” (1970), the only hint of the subject is revealed in the title. The painting’s strength emerges from the rich coloration and rhythmic brushstroke along with the “inner light” emanating from the compositional push/pull between form and void. 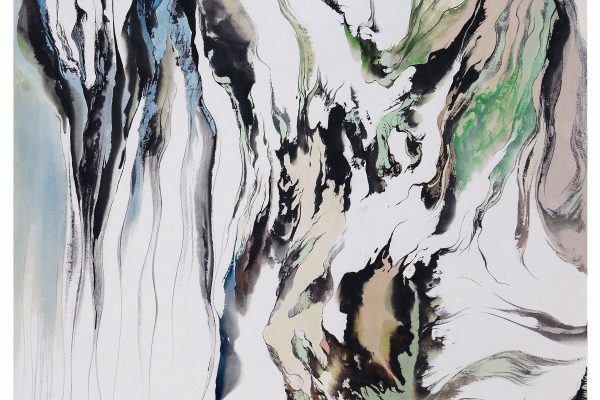 There is a connection to the abstracted landscapes of Shi Tao of 17th Century Yangzhou (Hung’s hometown) but also to modern 20th Century American painters such as Arshile Gorky and Mark Tobey. Yet, without the years of discipline under Prince Pu Hsinyu’s tutelage, Hung would never have had the technical skill—and confidence—to break free of the limits of traditional ink painting. What other student of Prince Pu can boast of belonging to these subsets of influence? And similarly, what other Abstract Expressionist can claim the technical rigor of training by Prince Pu? It is an understatement to say that Hung’s creative vision is unique. Hung Hsien was born in 1933 in Yangzhou, Jiangsu Province. Her family came from a long line of intellectuals from Yangzhou, one of the cultural and commercial centers of China since the late Ming Dynasty. At the outset of the Sino-Japanese War, when she was just three years old, the family moved to the Chongqing. There, she spent a happy childhood, sheltered from the ravages of war. Her family had a house in the country, surrounded by the lush, verdant Sichuan countryside. After the war, her family moved back to Nanjing for three years. Hung remembers attending the Chinese opera theatre with her older sister every week in Nanjing. To this day, Hung can recall the bright colors of the nien pu (face paint), the swirling robes and stylized movement of the actors on stage. But as Mao Tse-tung’s forces came to power, in 1948 her family resettled in Taiwan, where Hung continued her education through high school and college. While studying for her art degree at Taiwan Normal, Hung also took classes in ink painting with Huang Junbi and in oil painting with Zhu Dechun. Huang stayed in Taiwan and is considered one of the great post-war classical Chinese painters. Zhu Dequn emigrated to Paris in 1955, and became one of the most famous and prolific Abstract Expressionist painters of France before dying there in 2014. Upon graduating from university, Hung travelled to the United States in 1957 and visited numerous major museums throughout the country. Recently, Hung admitted the trip had a dual purpose: she really wanted to reacquaint herself with her childhood friend, T.C. Chang, who was working in Chicago as an architect. The trip must have been successful as Hung Hsien married T.C. the next year and settled in the Chicago area, where she would live for over 20 years. Her marriage to T.C. exposed her to modern and classical architecture in America and Europe. Known to her American friends as Margaret Chang, she watched as Chicago expanded exponentially in size and as a cultural center. While T.C. was part of the architectural team to design O’Hare Airport, Hung took classes at Northwestern and then at the Art Institute of Chicago. She was influenced greatly by two painting teachers, George Cohen and Theodore Halkin, both graduates of the Art Institute of Chicago and part of the “Monster Roster” movement of painters. Hung Hsien ‘s greatest influence, however, came from studying the works of Arshile Gorky, the Russian émigré “Father of Abstract Expressionism.” She explained to me recently that it was Gorky’s rhythmic line and sense of color, along with his theoretical bases for painting, that impressed her deeply. After years of concentrating on western oil painting, in 1965 Hung returned to the traditional Chinese media of ink and color wash on paper. By the late 1960s she was exhibiting her work around Chicago to wider and wider acclaim. In 1969, Liu Guosong, her former classmate from Taiwan Normal University, invited Hung to join the annual exhibitions of the Fifth Moon Group, which had been founded in the late 1950s. No longer limited by traditional Chinese practices and requirements, and going beyond her early fascination with modern western art, she discovered her own vision of merging east and west. 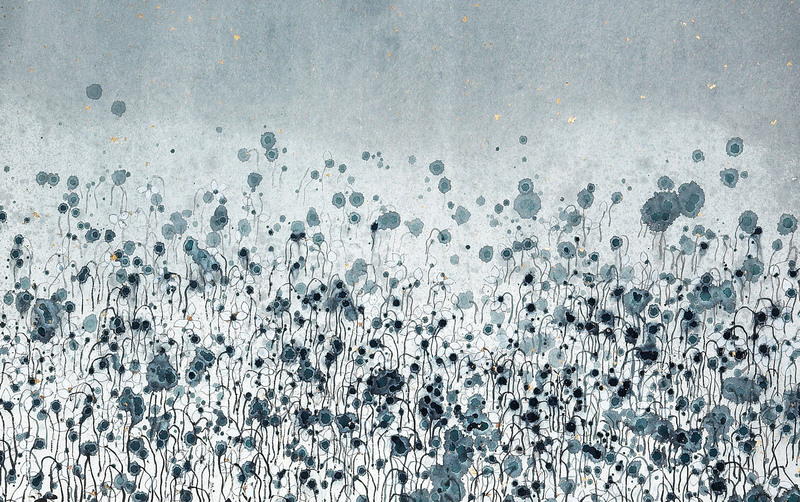 These paintings are her “landscapes of the mind,” to use a traditional Chinese phrase which suggests the artist’s synthesis of a perception of nature and of inner feeling for it. We feel that we are almost at one with the universal spirit, the age-old theme of the great Chinese landscape tradition – but Hung Hsien’s means are completely her own. In the mid-1970s illness and surgery slowed Hung’s production. However, a trip with her husband for an architectural project on Hornby Island, near Vancouver, rekindled her creative passions. During her solitary visits to the island’s deserted beaches she filled her sketchbooks with brush drawings. She was so moved by the experience that she returned to Hornby Island three times in the 1970s. Since the 1980s, Hung’s importance as a pivotal figure in modern painting has been known to only a handful of Asian art history scholars in the West, due to her disinterest in self-promotion. The unique character of her painting also defies easy categorization. Ironically, one of her last group shows was entitled “Ten Texas Women Artists” (1991-92). How many Chinese-born artists can claim that label? For this exhibition we chose works from the 1970s, a decade when Hung Hsien reached the peak of her creative powers. The fluidity of the brushline is impressive in a work such as “ Valley After the Rain”; the outline is like a fine, tensile wire, flowing without inhibition across the surface of the paper. The coloration is subtle, with luscious purples and blues. The word “voluptuous” comes to mind. This painting could hold its own next to one of Georgia O’Keefe’s iconic flower paintings. In “Floating without End,” the composition is a swirling, vibrating abstraction, spread across two huge scrolls. The impact is arresting, as if one were looking into a spiraling funnel cloud or the turbulent waves of a tidal pool. The large scale (approximately 6 x 6 feet) of this powerful diptych arguably makes it one of the most important pieces of Hung’s entire career. Hung Hsien is the most intriguing artist I’ve shown in the fifteen years of M. Sutherland Fine Arts. With Hung’s exhibition during Asia Week 2016, it is my hope that the art world will take notice and recognize her singular position in the pantheon of modern Chinese painting. Our Asia Week 2016 exhibition draws from only a portion of Hung Hsien’s personal collection of favorite works. It is our hope that in the future the gallery will show more selections of Hung Hsien’s unique paintings. Margaret and her husband, T.C. Chang, will be present during AsiaWeek 2016 Open House Weekend. Asia Week NY 2016 is almost here! M. Sutherland Fine Arts is extremely happy to be participating in Asia Week NY 2016. Complete information about our exhibition and hours will be posted shortly. In the meantime, additional information can be found here: Asia Week.